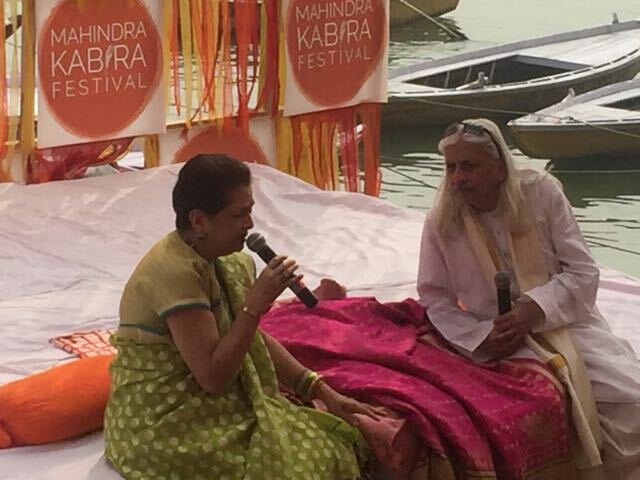 Music by the ghats of Varanasi - The Mahindra Kabira Festival - Ghumakkar - Inspiring travel experiences. In March 2016, we were driving back to Delhi from Darbhanga, and took a 2 days break at Benares. 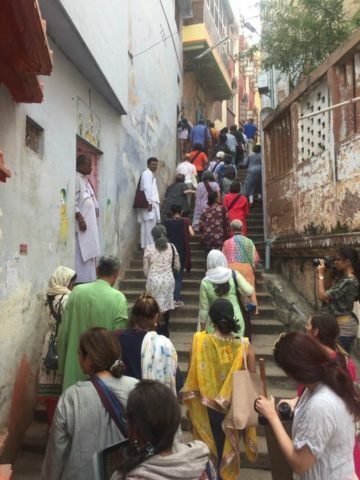 This was not our first visit and our prior visits did take us to Ghats and the Temples, but we tasted the real old Varanasi, the unending maze of streets and the bubbling life inside it, only this time. Then, we stayed at Stops Hostel in the city, to have our 11 year old get a sense of accommodations, where the hostel had common restrooms and basic backpacker-ish comfort and logistics. With an absorbing visit back then, we knew that when we come next, we would be staying in the old city – right next to the Ghats. So far we had just flirted with the idea of losing yourself in Varanasi, this time it had to be a complete immersion. So when we read about Mahindra Kabira Festival 2017 and the rich lineup of music artistes, performances, heritage and food walks, the first thing we did was to block the dates and book travel tickets. We all have grown up reading the timeless Dohas (couplets) of Kabir (wiki). If one was going to a debate or an extempore competition, one could strategically fit a doha or two. Somehow you always recite a doha, feeling as if they are your words, taking pride for the wisdom it speaks. So with the background in place, we were looking forward to this short trip and this time it was to be only two of us. An early break from work, an evening Vistara flight from Delhi and a short walk on the tarmac to enter the International Airport of Varanasi, we were greeted with this soulful set of artistes. What an apt way to welcome. Bravo Teamwork Arts and Mahindra. We had chosen to stay at this place called Ram Bhawan, right behind the Darbhanga Ghat, as our inn for the three nights. The airport cab drops off at “Godowlia” and you swim through the Varanasi magic, manoeuvring street vendors, cows, pilgrims returning from the evening Arti of Dashashwemedh Ghat, more cows, constantly changing aroma from Dosa to Kachori and finally saving and praying from an impending monkey attack, we reached our place. 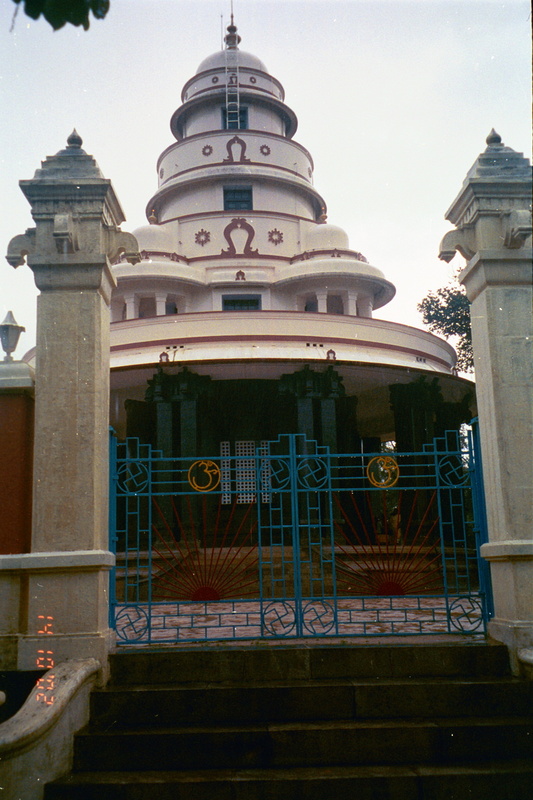 Ram Bhawan, is a very old building converted into a home-stay with cosy rooms, basic food and common rest rooms. Since the plan was to be on the road for most of our waking hours, we plunged in. The best part of places like Ram Bhawan, is not the place in itself, but the people who make these home-stays memorable. Unlike any hotel, you do find avenues to interact with other guests, often from across the world, over tea/food and learn a lot of new things. At under INR 2K per night, with very basic breakfast and well-cooked veg lunch I would absolutely recommend this place (Booking.com link). Though the festival was to be from Nov 10-12, there was only one event on Nov 10th, and that too a private one at Brij Rama Palace. While chatting with Katie, a fellow guest, at Ram Bhawan, she rued that how can a festival be of three days and have nothing on first day, except this private party at Brij Rama Palace. I am sure Teamwork Arts, who organise this event, can do better. We did use the time though to do Ghat-hopping, snacking at all the Kachori/Pakora/Dosa, gulping those thick Blue Lassis (too expensive, try once though, share a glass) and downing hundreds of teas and paans, eagerly waiting for the morning of Nov 11th for the first set of music performances of #MahindraKabiraFestival. It was to be a early morning wake up, wash and climb down to the Darbhanga Ghat. Early mornings are therapeutic at Ghats. Teamwork Arts was serving hot tea and Churwa/Poha, very very apt – especially for a place which is called, ‘Darbhanga Ghat’. If you know me, you know why I am saying this. Baked beaten rice, or Chura Bhujja as it is called locally in Maithili, is staple to the whole of Mithila. It was followed by sufi renditions of Kabri’s work by Rashmi Agarwal. We didn’t sit through the whole program and walked back, after registering for the city-walk. To remind, the day started pretty early for us, so we decided to take a longer walk and have some kachori-bhaji breakfast. As per plan, there was a ‘Dastangoi’ by Ankit Chadha and we wanted to be part of it, since we have attended Dastangoi sessions in Delhi, a few times. But for some reason, we assumed that this event would be held inside the hotel, at Brij Rama Palace. So when we returned back to Ghat at about 1130 hours, we found that we had missed it. But we did catch up the talk on ‘Benarasi Saree’ by Mrs. Abha Dalmia. Abha Dalmia is a philanthropist and a saree veteran in her own right. She has been working on keeping alive the legacy of Banarasi sarees for decades and is a celebrated designer popular for her label Royal Trousseau. Through her talk, she shared her experience with Banarsee weaving, the weavers, the ensemble and what makes the Banarasee Weave so special. She also showed some samples of how they have been doing fusion designs and experiments on the Banarasee loom. It was completely unrelated to “Kabir” but very interesting and enlightening even for me. And then started our city walk. Curated by local experts, Mr. Navneet Raman who belongs to Banaras and runs a few organizations there (including http://www.kritigallery.com/default.aspx) and his accomplice Mr. Ajay, this walk was the most rewarding event of the whole program for us. And it deserves a story of its own. Hopefully I get to do it, soon. The day was yet to finish and it had already been so fulfilling but there was still one show left and that was to be at ‘Chhota Nagpur Bageecha’ at Assi Ghat. While the morning session was right at the banks, bare and free, the evening was planned at a small ground with food stalls, ittar (perfume) counter, large open space, bigger stage, lights and all the ingredients you expect from a music concert. There was seating on ground on daris and maslans (round pillows) in the font followed by chairs. The event was open for all and in no time was filled to brim. The star performer was Shubha Mudgal. We were on time and the evening started with this group from Rajashthan. Nathu Lal Solanki is the maestro of the kettledrum or the nagada, a Rajasthani folk instrument, Nathulal Solanki hails from the prestigious Pushkar Sangeet Gharana and has many music commendations to his name. Along with him, was Vishnu Mishra, the vocalist from a traditional family of musicians of the Benares gharana. They performed with so much élan and enthusiasm that in no time, there were people dancing and singling along side. Quickly followed this high-octane performance, was the duo of Bindhumalini and Vedanth along with Ajay Tipania. From the rustic and rooty Nagaada, we were now transposed to soulful Kabir. The next day, I happened to meet the duo at Ram Bhawan and talked more about music. And then came Mahesha Ram – all the way from Khatanga village near Jaisalmer in Rajasthan. Maheshaji presented the folk style of the Meghna community who are the traditional carriers of the poetry of many mystic poets and perform regularly through satsangs and jaagrans. Each one bringing so much of joy, happiness and a muqtalif (different) music to the party that it was hard to believe that you are actually amid so much of love, it was overwhelming at first and then humbling for rest. Though Shubha Mudgal was yet to start, but we were feeling so full that it is hard to explain. 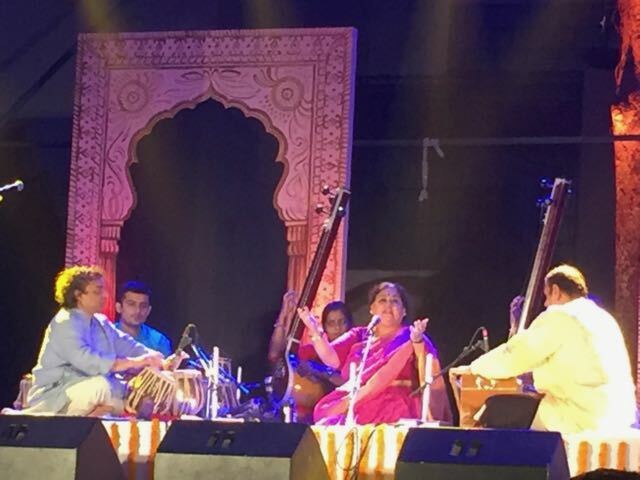 By now the stands were full and with a lot of applause, Shubha Mudgal started her first bhajan. About 3-4 months ago, we had the opportunity to listen to Shubha Mudgal at a small gathering, so everything looked so familiar and homely. Her husband, Aneesh Pradhan on Tabla, her students on Tanpura, the gentleman on the Harmonium and even her sound guy, with long beard over a shaven head. It was the impact of the previous sessions, that we had lost ourselves already and just sat still and lost more of ourselves. We had so much of music and Benares the other day but that did not deter us from waking up very early and again heading to the ghats. Day 3 introduced us to the super talented, budding star Harpreet Singh, singing solo with a guitar, and the amazing Mrs. Sucharita Gupta. While Harpreet sang some soulful self-composed pieces on Kabir, Mrs. Gupta worked her magic with thumris, bhajan and you-name-it on Kabir. It is another level of performance when the artist herself feels elated and wants to continue performing bringing out new stuff from the bag. And classical/semi-classical Indian Music works well with our taste and sensibilities. So it was, as they say, magical! This was followed by a talk by Vinayak Sapre covering his book ‘Dohanomics’ in which he has interpreted Sant Kabir’s and Rahim’s couplets in the context of personal finance. MKF gave us a lot of magic. All through the festival, I could sense the soul of the immortal Kabir, around us, listening to himself through music, cheering his own words of wisdom which are still as relevant as when they were originally recited, no less than 500 years ago. They say that you go to Benares to lose yourself, I did too and that would be my motivation to return again in 2018. Thank you Mahindra and Teamwork Arts. Wow Nandan! Such an enticing location and such seasoned artists, you sure would have had a great time! I kept following the Mahindra Kabira FB page pre-event and during those days too. I must say, each of the performances just made me say “I wish I were there too!” to soak myself in the holy Ganges and the scintillating music. Thank you Archana for your continuous encouragement. I think I managed to share only a glimpse of the mega festival :). Agree that it is an amazing location. The event started only last year and I can see, that over coming years it is going to become one of the must-visit music festivals. Varanasi is always enticing – crucible of all that has ever there been !!! MFK appears to be such a grand tribute to the ‘K’ – I mean, yes, its the dohas ingrained from our school text books (bada hua so kya hua / kankar pathar jod ke / mala pherat jug gaya / jaat na puchho sadhu ki / etc etc). Thanks for bringing out the celebration dedicated to those glowing lights ….. Yes Auro, it is indeed. Interestingly my 12 year old didn’t seem to know a lot of about K. It was very well thought through so I could not, not share this. 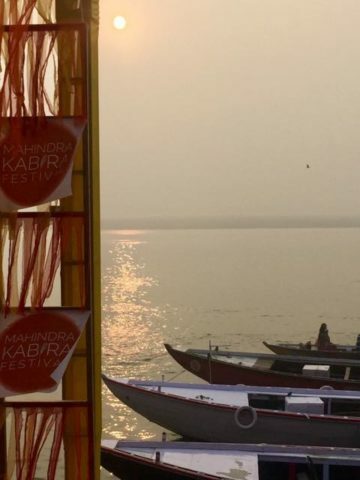 #MahindraKabiraFestival is probably one another execute to visit Varanasi, probably a good one. Thank you Muskan. I wish that you soon get to visit the place. Indeed VJ, it would be. Great to see you here. Having being there at the festival in person, I can only endorse all your views. I wish the event was planned better in terms of dates and artist line-up. They could’ve done better with timing them at least. The organized walks were a treat and the backdrop couldn’t have been better. In all, one can never have enough of Banaras. Or Kabir. Definitely not ever if it is a bundle of both. Agree. Its in its 2nd year so I would guess that it would evolve over time. Beautiful description! Very well narrated! I have been to Varanasi and can sense some of it. Would love to join this festival next year. Thanks for sharing. Thank you Adi for the praise. Yes, it should be a good one to attend. Nandan it’s always a pleasure reading ur travel stories. Ur this story transported me to the ghats of Banaras with melodious music playing in the background . This music festival sounds like an amazingly enriching experience doubled up with the site seeing of banaras city. Would love to experience the magic that u described, how do we know when this festival will happen next? I suggest u to have a must attend list of such events on ur site. That would make the travel experience more meaningful . Thank you Charu. Yes, it was indeed a very rich experience. They have a website at http://mahindrakabira.com and I guess one can leave their email id. It should happen again in Nov/Dec 2018. And thank you for the brilliant idea of listing these events. I will list down the key events of 2018 with dates, as much as I can get, and also the Ghumakkar stories for the ones we have. Going by your writing skills and the way you presented the story, it seemed that I was a part of the journey to Varanasi. A very detailed post and nicely written post. Thank you Pooja for your encouraging words. I wanted to add more detail but then shied since I keep trimming everyone’s stories all the time. I have been to mystic city of Kashi just once but event such as Mahindra Kabira Festival could be all together a different experience. A very well written story and reading through it felt I was there. Thanks! Thank you Karan. My write-up is just a very short glimpse of the festival. Try to make it next year, its really good. This is such a detailed writeup. Quite interesting. Banaras is so intriguing and festivals like this one add much more to the charm. We spent a quick weekend there, but hungry for more. Looking forward to going there again for a longer duration and hopefully to one of such festivals. Thank you Shaguna. Yes, I know you guys were there early this year. This was my 5th trip and I can go as many times again :-), so plan a longer trip when your time allows. Mahindra Kabira Festival 2018 dates are Nov 16 – 18. Plan your travel. The artiste list is not yet published but the lineup should be good, last in 2017.